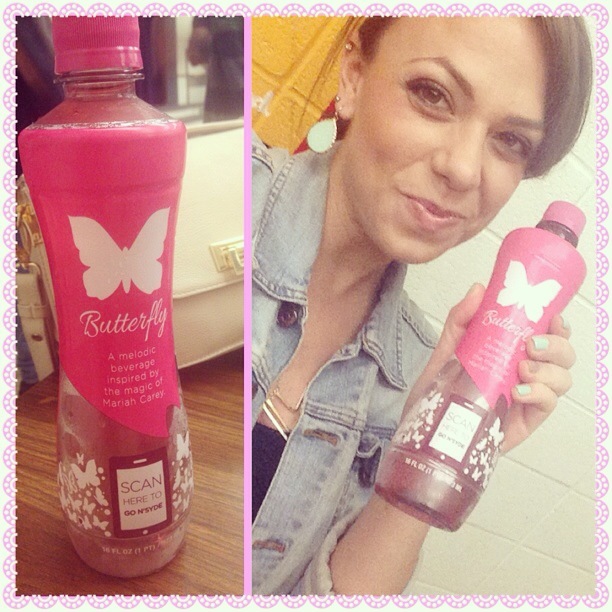 It basically took a genie and about a thousand wishes to bring my dream to life, but it the end, we did it! 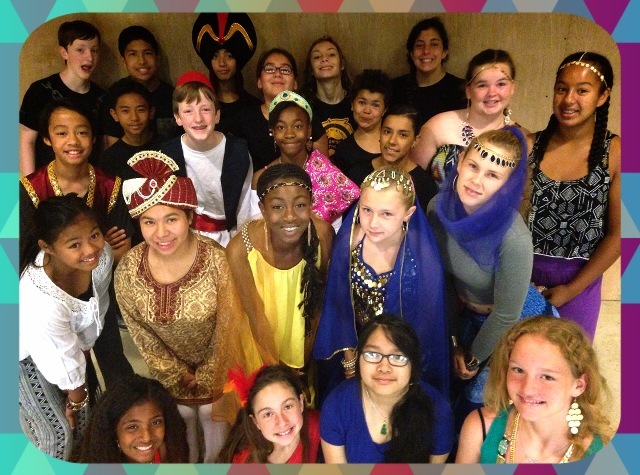 Twenty five middle school students and I put on the very first summer musical production ever at our school. And it was fantastic! I’m not even kidding, it made grown men cry. How did we do it? Well, it was a bit of a whirlwind, but I will try and break down the steps for anyone who is interested in starting something like this at another school. It will drive you halfway to crazy pulling everything together, but it is so worth it! It’s a long story, but it involves two buddies on a road trip, my parents at a pub 600 miles from where I live, some small town friendliness, and a string of coincidences and shared passions. In the end, I met a man who runs a foundation in the same town where I teach. The purpose of this foundation is to provide grant money to teachers who bring performing arts opportunities to kids who otherwise wouldn’t have those opportunities. I sat down with the director of this foundation, and our passions aligned perfectly. We both believe that the performing arts can be transformational in young students’ lives, and that every student deserves to have access to high quality performing arts programs. We saw an opportunity to fill a gap in the school where I work, to not only provide the very first musical theatre instruction there, but also to offer a summer program as an alternative to playing Minecraft or watching TV for two and a half months. We also wanted it to be free to any student who was interested in participating. I work in a low-income neighborhood where many students can’t afford to attend any summer programs at all. I developed a grant proposal and a budget with the things we would need to make the summer production happen. The foundation approved my grant, and agreed to fully fund the program. I promise you, there ARE still good people in this world who are willing to help kids in their communities! We worked closely with my principal and the performing arts director at the district office. Without the cooperation of administrators, the program would have been dead in the water. As I teacher, I had to rely on administrators for facilities, paperwork, insurance, processing funds, etc. 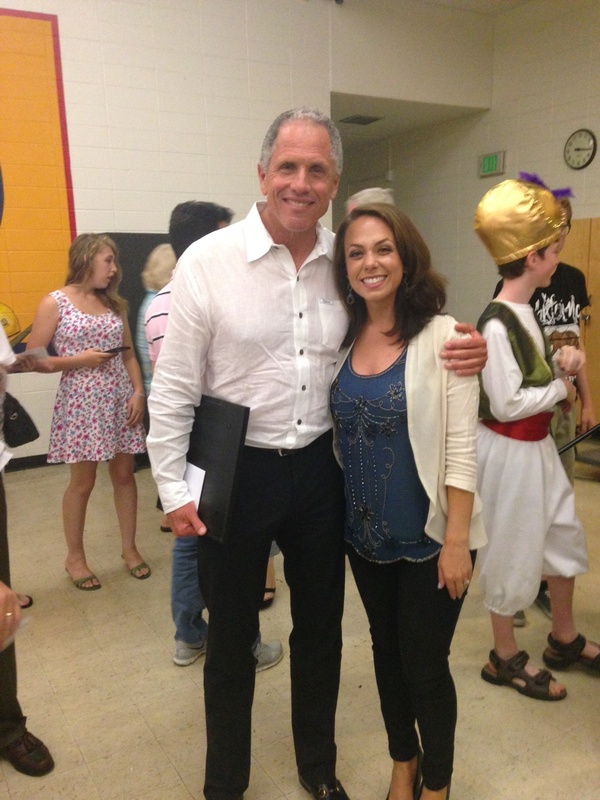 I am lucky that my principal is as much of a musical theatre nerd as I am! 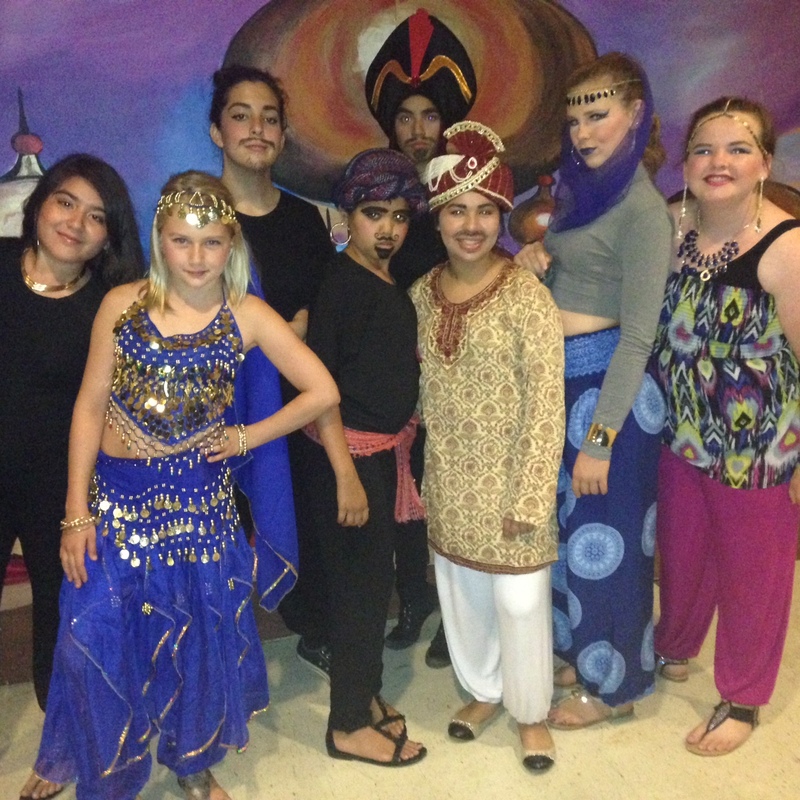 The world of Aladdin and Agrabah just seemed like a fun place to be over the summer. I love the music and the costumes and the setting, so choosing a show was the easy part. I highly suggest purchasing a script and licensing rights from MTI Productions. Generally, this will cost about $1,000 (but that’s why you got a grant!). You will receive high-quality, professional scripts, background music tracks, and you can order t-shirts and a graphics package. If you are working with middle school students like I did, you will definitely want to choose a script from their Broadway Junior Collection. The length of the shows is perfect, and the humor level is spot on. There are plenty of shows to choose from, and I can’t wait to pick one for next year. If you choose a full-length adult production, your show will likely be too long and will not play to the strengths of middle school students. The director’s book comes with everything you need to run your auditions, so you need to purchase this package before the auditions. Since it was my first time dealing with the licensing and all of that, this process took me several months to complete. Make sure that your grant money is ready to go when you start this process. Before the auditions, I held several informational meetings at lunch, and sent home audition permission slips. I listed the dates and times of every rehearsal and performance and made it clear that all rehearsals were MANDATORY. I knew there would be kids who would be excited to sign up, but would be out of town for some of the rehearsals. Not gonna work. We only had 4 weeks to rehearse (I know, I set myself up for a miracle from the start), so perfect attendance was non-negotiable. The perfect attendance policy weeded out any kids who weren’t really serious about the production, so I ended up with exactly 25 students at the audition. Twenty five was my max, so I got to keep everyone! The majority of my group was girls, so I had to play around with casting a little bit in order to cover all the roles in a play with ONE FEMALE character. (How did I not think of that ahead of time?). 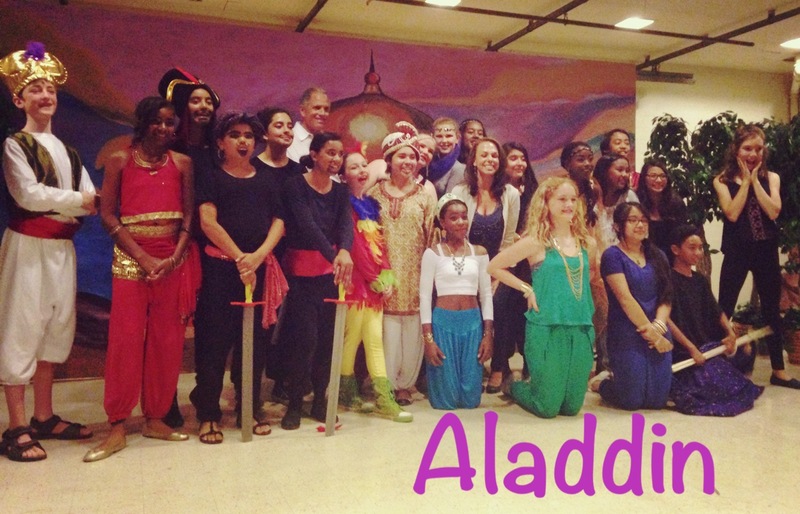 We ended up interpreting Genie as a girl, and a lot of girls just played male roles. And they were fantastic! The great thing about working with middle school students is that they are still willing to be silly and goof around without worrying about being cool. 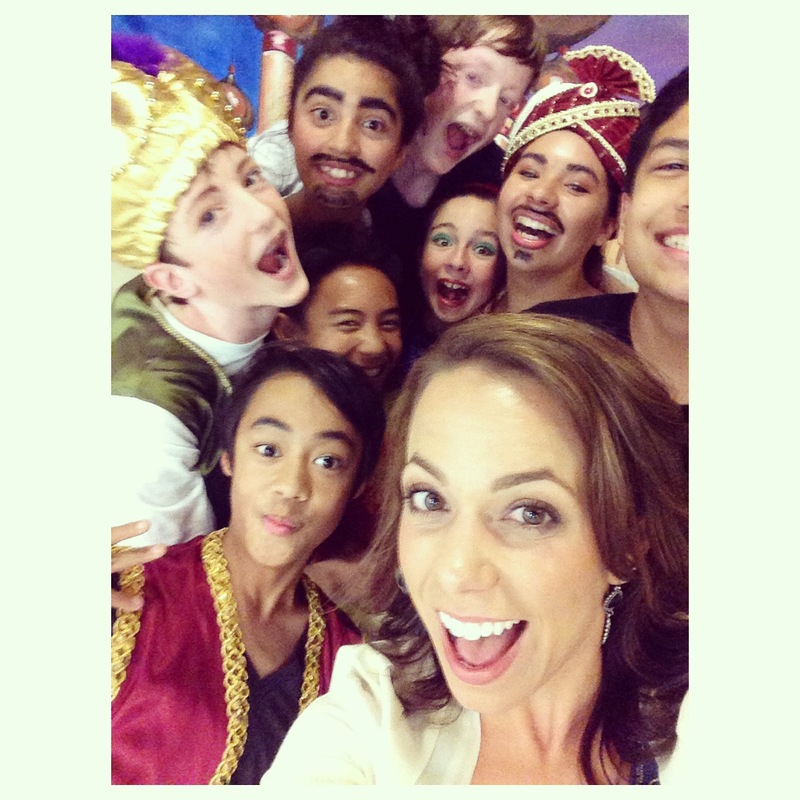 To me, middle schoolers are IDEAL actors to work with. Many of the students who auditioned were from my 6th grade English classes, but I also had some 7th and 8th graders. As I mentioned, most of the students were girls, but we ended up with a very diverse cast. We included students from the SPED department, and Honors classes. I even brought over two of my piano students from another middle school to help me out with choreography. There were a few kids who had been in productions before, or who had taken dance lessons or something, but the majority of them had no acting experience whatsoever. This meant that they were humble and curious and ready to see what they could do! I included team-building activities and opportunities for students to get to know each other as often as I could because in a production like this, everyone has to rely on and trust each other. We started our own Instagram hashtag and took Friday afternoon trips to get frozen yogurt, just to promote friendship and teamwork. 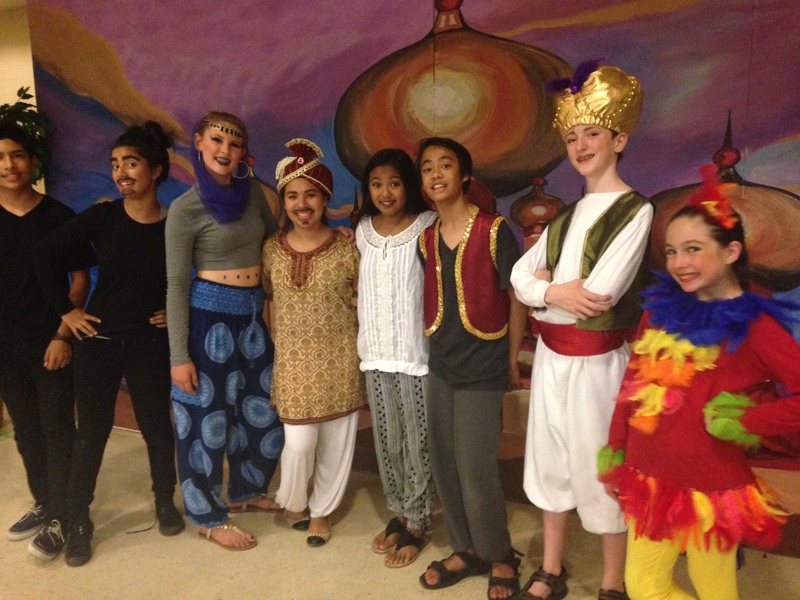 Many of the students became very close friends by the end of the play. They’re so stinkin cute. We only had SIXTEEN rehearsals to pull this whole thing together. We rehearsed from 8:30-12:30 Mondays through Fridays for about four weeks. I wanted our final performance to be July 3rd, because after the July 4th weekend it can be really tough to keep a full cast at rehearsals at all times. I decided I would rather have a shorter, more intense program, instead of dragging it out through the whole summer. There comes a point in every play where everyone starts to get fatigued and sick of each other, and you can kind of avoid that if you keep it short. Short and stressful! We started with choreography. I think the choreography makes or breaks a performance, so I wanted as much time to refine that as possible (and it TOTALLY paid off). I wasn’t even sure if any of the kids could dance, but they all did so well! My two piano students (who have been in several productions at their own school) taught a lot of the choreography, and I worked out the formations and transitions. We dubbed Fridays “Friend Like Me Fridays” because that routine was the most complicated and always needed a little more cleaning up. MTI provides a choreography DVD which we used for about half of the production, but we also included a lot of our own moves. Then we started going through the script scene by scene, blocking as we rehearsed. During the weeks between auditions and rehearsals the students were supposed to start memorizing their lines, and most kids were pretty good at their lines after a few run-throughs. The most important thing I kept reminding them of was facing the audience and speaking to the audience. It’s a play, we understand that it’s not real life and you might not face the actor that you’re speaking to full on. Stage presence and blocking just take some getting used to and some coaching. By the end of a few weeks, those kids were pros. Mondays were “Music Mondays,” and we would sing through the songs without choreography. Some of those Aladdin songs are hard! I teach voice lessons, so I would lead the kids through warm ups and help them with their parts. 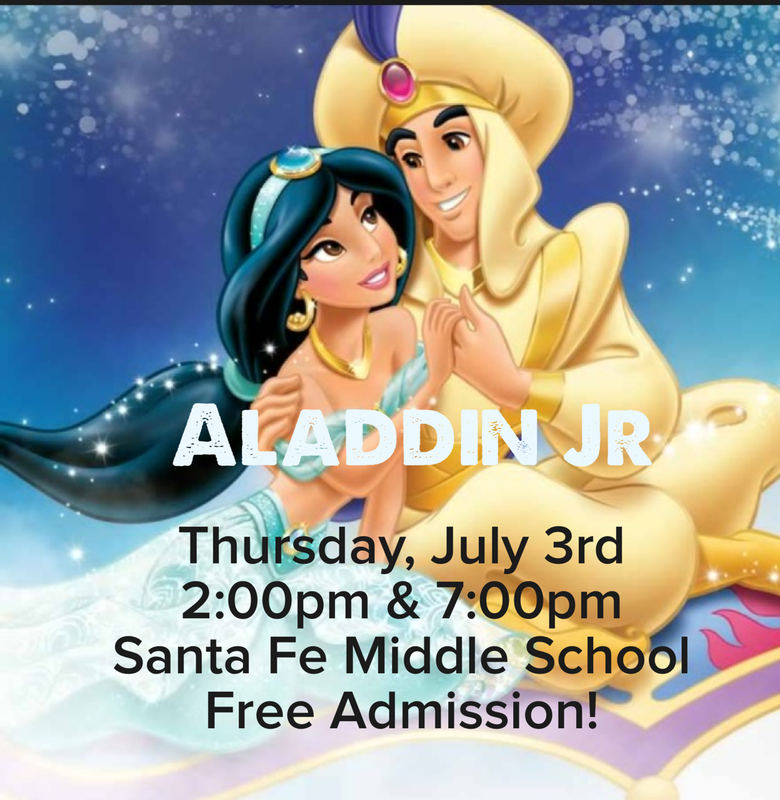 Even after all our rehearsing, “A Whole New World” was still a little shaky, so we went with our strength–we added cheesy choreography. Ballerina stars and moons swirled around Jasmine and Aladdin on their magic carpet as they sang. And it was hilarious. Play to your strengths, and don’t take any scenes too seriously! step 5: take a break and do something fun and crazy! We were fortunate enough to receive some extra grant money to take the whole cast to Disney’s California Adventure for free. Not only was it a nice little incentive/ reward for all the kids’ hard work, but we got to see a live performance of Aladdin! After practicing for several weeks and beginning to really get into character, it was great for the kids to see a professional play their part. The show is absolutely amazing (I wish we could borrow their magic carpet! ), and we took away a few ideas from the performance to incorporate into our own show. We all wore our Aladdin t-shirts so that I could spot my kids from far away. At the beginning of the week I let them decorate their shirts during rehearsal breaks (basically just to occupy their attention while I worked with smaller groups). Clearly they like to keep things simple and neutral. I went on Tower of Terror with two of my 6th grade girls (excuse me, I mean 7th graders now! ), and I ended up curled up in a ball on their laps like a total wimp. They will never let me forget it now! All the kids got to spend plenty of quality time together, and for the many that had never been to California Adventure before, this was a pretty exciting day. We took the trip one week before the performance, just as things started to get really stressful, so it was a perfect day to relax, enjoy some rides, and to be inspired to make our show magical. I purchased costumes for most of the cast with just a few hundred dollars. I gave each actor a description of the costume that I envisioned for them and asked to start collecting items that might work. Some kids just needed some black pants, a white shirt, sandals, or something easy like that. These items they brought from home. 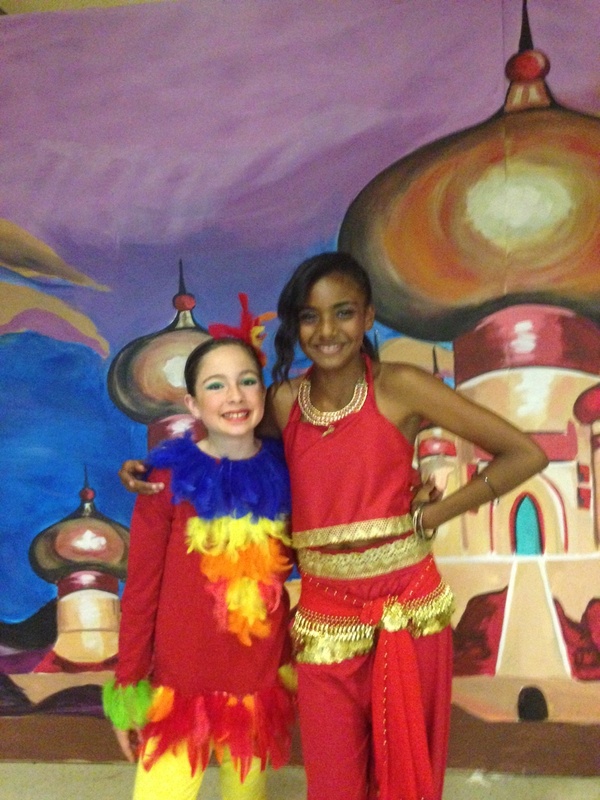 These two girls had incredibly talented mothers who handmade their gorgeous costumes! 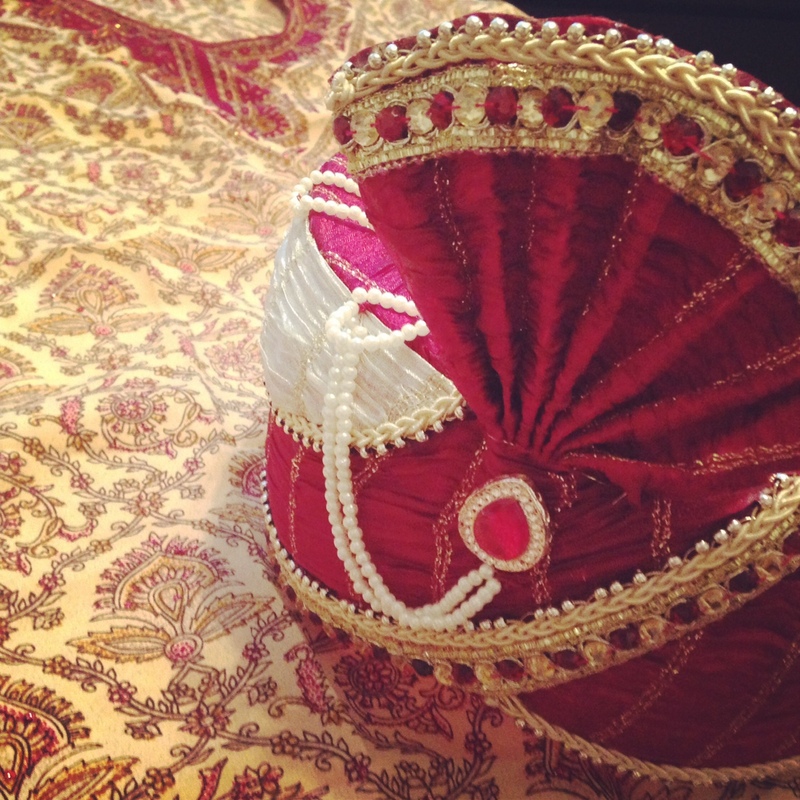 I ordered a lot of the more elaborate pieces on Amazon, like Aladdin’s fez and Jafar’s turban. We found a yoga apparel seller with harem pants in every color, so I ordered about six pairs in various sizes and just gave them to whoever needed some. Fortunately, the harem pants/Middle Eastern look is very in right now, so I was able to just go to Forever 21 and find a lot of the things we needed. Forever 21 has a great jewelry section, and I got a ton of cheap pieces that added a lot of flair to the costumes. I had to replace a tire one Saturday afternoon, and the shop happened to be right next to this huge Indian street fair. I know, I know, Aladdin does not take place in India, but some of the items I found were so beautiful, and suited what we needed at least as well as some of the Halloween costume pieces from Amazon. Our production was not exactly a pillar of historical accuracy anyway, so I bought this gorgeous headpiece and shirt for the Sultan. 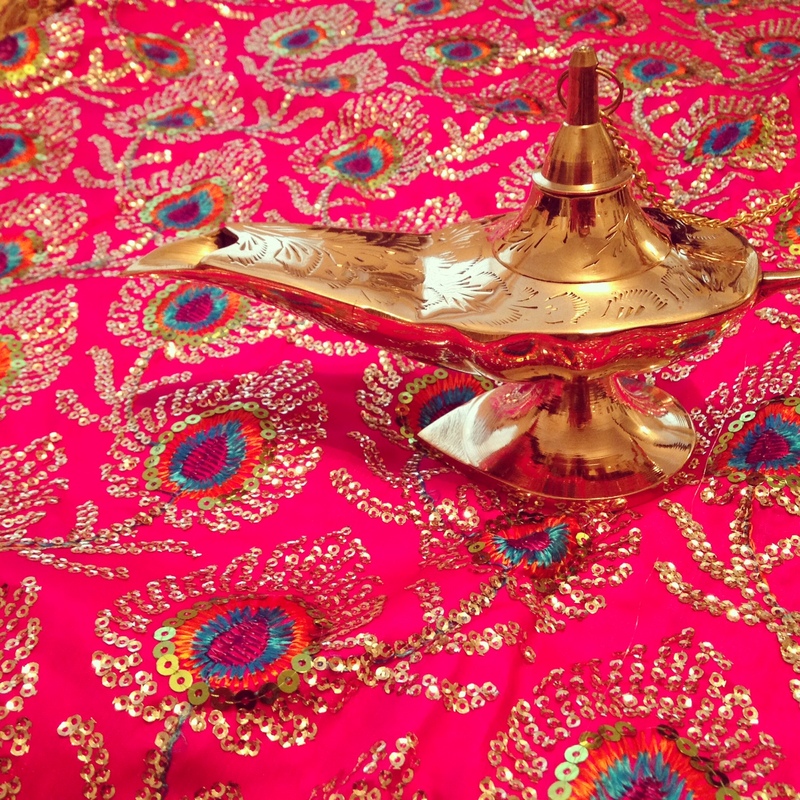 Of course a magic lamp was central to our play, and I found this one in one of the Indian shops. I wasn’t exactly sure what to do with this fabric, but it was so beautiful that I figured we could find a use for it somehow. We ended up draping it over Jasmine’s shoulder for the wedding scene and it looked great. 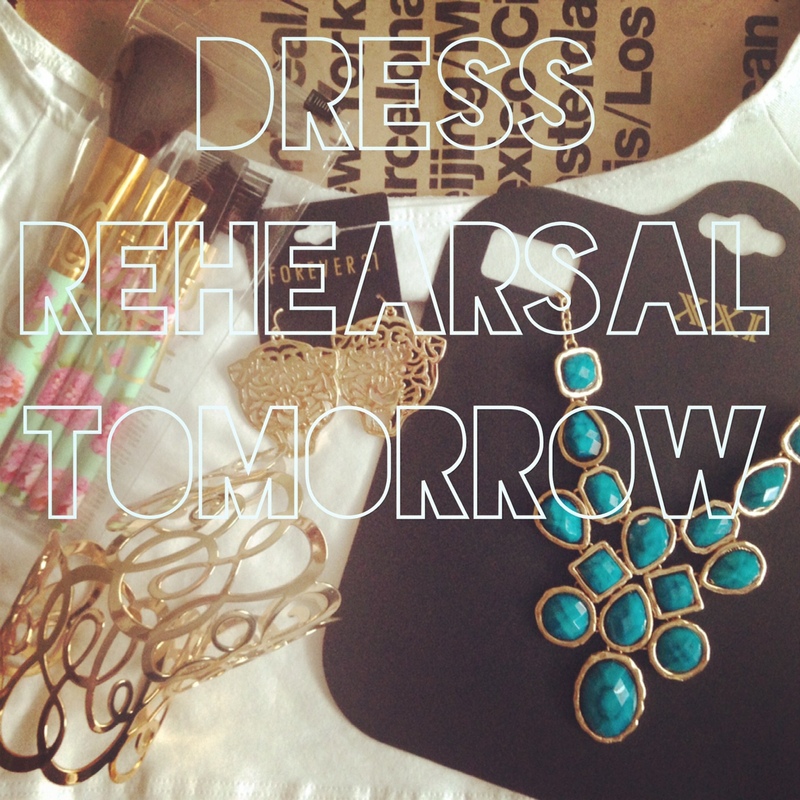 Here are a few of the jewelry pieces from Forever 21, and Jasmine’s white long-sleeved crop top from American Apparel. The teal necklace looked perfect on Jasmine, and I loved the tiger earrings for her. Raja, Jasmine’s pet tiger from the movie, wasn’t included in our script, so the earrings were our nod to him. Gold shackles were a must for Genie, and these swirly gold bangles were only $4 each. (This was an Instagram post to remind the kids to bring their costumes). I did not have time to deal with flyers and printers and all that mess. I made a little digital flyer on my phone and texted it to all the cast members. They posted it to Instagram and Snapchat to let their friends know about the performance, and their moms posted it to their Facebook walls. We didn’t need to pack the auditorium in order to fundraise, so we just wanted to make sure that everyone who could come out and support the kids knew when to come. When we started rehearsals, our stage looked like that scene from Sister Act 2 with the broken piano and the graffiti all over the walls. According to our custodian, no one had used the stage in the 2o years that he has been there, and it was basically just a storage area for broken desks and chairs. We had help cleaning everything off, but the stage was still completely bare. We had no side curtains or back curtain, but one of the other teachers at my school offered to build us this fantastic plywood backdrop. Twenty four hours before our first performance the backdrop was still blank. 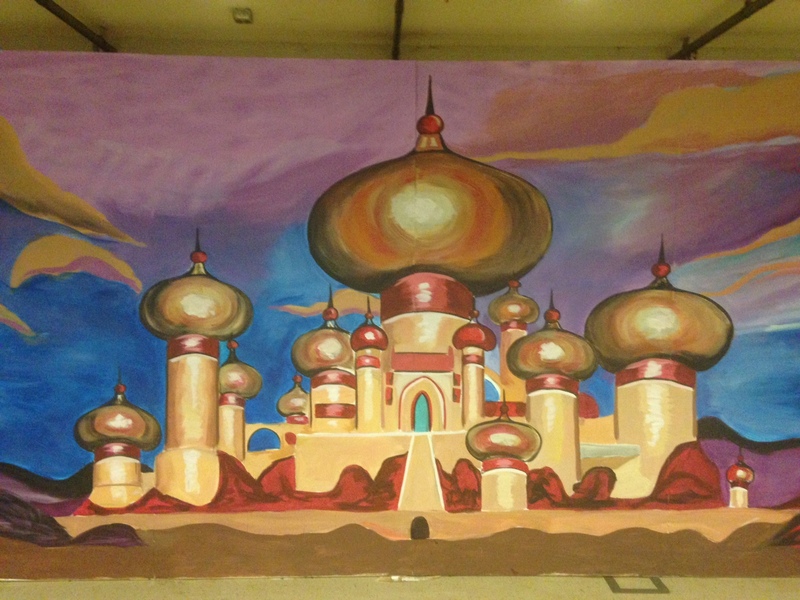 I hired a local muralist to come paint it, but he couldn’t make it until the day before the performance. This meant that we couldn’t use the stage the day before our show. I was stressing out big time, but after a few hours of rehearsal at the back of the cafeteria, I turned around and saw THIS! I couldn’t believe my eyes! We still had no side curtains, and only one of our front curtains actually closed (a kid’s brother had to hold on to the other one and pull it open and shut for every scene), but hey, our backdrop looked great! I think it distracted from what we lacked and brought our show up to a whole new world–I mean, level. (Sorry, couldn’t help it!). The older girls were great at doing everyone’s hair. We were not shy with the painted-on facial hair. step 10: break a leg! I cannot even explain how proud I am of these kids. Most of them had never performed before in their lives, and they put on a spectacular performance. They were hilarious and professional and coordinated and humble. They supported each other and took care of everything from the curtain(s) to the sound to backstage management. It was incredibly rewarding to watch them interact with the audience and to see the pride rise up in their chests as hundreds of people laughed at their jokes, applauded their dancing and swayed along with their singing. Parents looked at their pre-teens in a whole new light as they witnessed their kids’ talent, dedication and hard work. It was such a gift for me to be able to be a part of this group of special kids. But don’t take my word for it–watch the whole performance for yourself here!